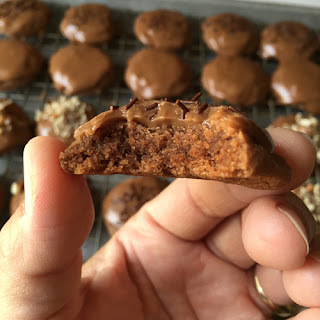 This cookie recipe comes to you courtesy of Cookies and Cups, a blog I just found on Pinterest when I searched for "cookies and bars" this morning. 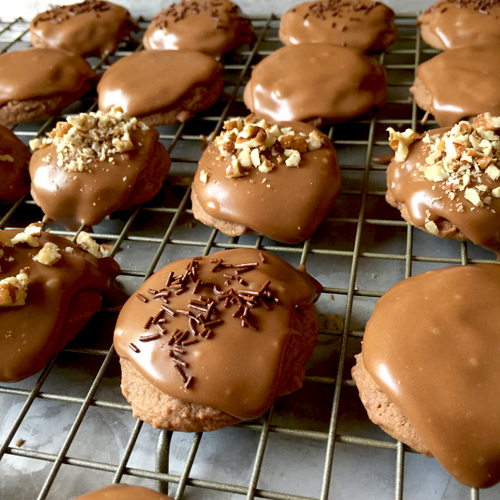 Shelly over at Cookies and Cups is a genius for coming up with this recipe. It really does taste like Texas sheet cake, only a little more dense. I decided to go a little rogue with this recipe and add nuts and sprinkles to the tops of some of them. I know Texas sheet cake sometimes has nuts in the icing, but I was afraid the nuts would all slide off if I mixed them with the icing. I also had these cute chocolate sprinkles needing to be used, so there you go. The plain ones taste just fine too, if you must know. I love the texture of these cookies, and I think they may actually have the chocolate cookie texture I've been searching for for years. They are not chewy at all--they are dense, but tender, and ever-so-slighlty salty. The texture is a mixture of cake, fudge, and cookie. They are very sweet, by the way, thanks to the icing. So if you're not a person who likes your sweets to be super sweet, this may not be the recipe for you. So there you go. Texas Sheet Cake Cookies. Thanks, Shelly at Cookies and Cups for a fun new recipe. Preheat oven to 350 degrees Fahrenheit. Line a baking sheet with a sheet of parchment paper and set aside. Melt the chocolate chips in a microwave safe bowl (about 55 seconds to 1.5 minutes at 70% power) and allow to cool so you can't feel the heat when you touch the bowl. In a medium mixing bowl, cream the butter with the 1/3 cup sugar. Then add the cooled melted chocolate and mix until combined. Scrape the bottom and sides of the mixing bowl and mix again to make sure there are no white streaks. Add the egg and vanilla extract and beat until incorporated and fluffy. Add the salt and baking powder and mix to incorporate. 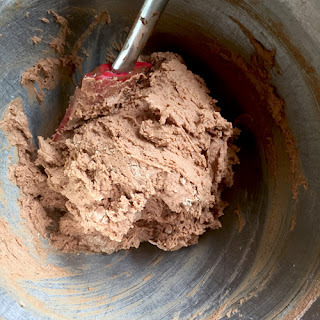 Add the flour and mix on low until combined. Scrape down the sides of the bowl and mix again briefly to incorporate any remaining flour. 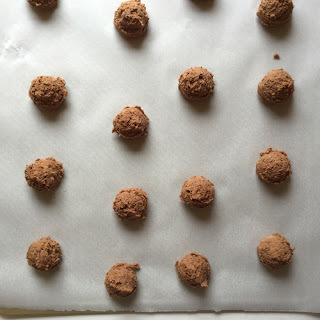 Place 1-tablespoon scoops of dough onto parchment lined baking sheet, leaving about 2 inches between balls of dough (I used my small Pampered Chef cookie scoop). With your fingertips, gently pat out any stray bumps or spikes in the dough balls. After cookies have all baked and cooled, prepare the icing. In a small or medium saucepan on low heat, melt the butter. Add the cocoa powder, milk, vanilla, and powdered sugar. 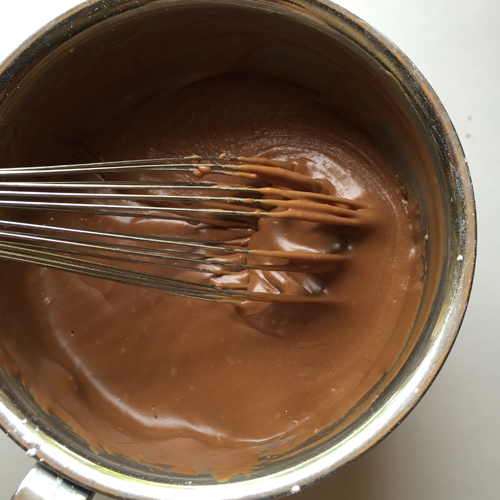 Whisk until icing is smooth. 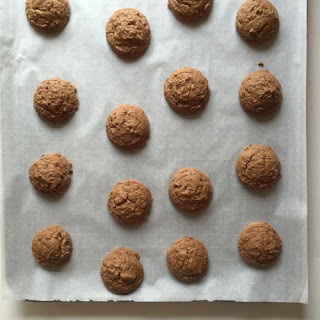 Place cooling rack with the cookies over a baking sheet or a sheet of wax or parchment paper, in order to catch the drippings from the icing. Using a small cereal spoon, scoop about 2 tablespoons of the icing and pour it over a cookie. Use the back of the spoon to gently spread frosting over as much of the cookie as possible, allowing the exess to drip and ooze all over. 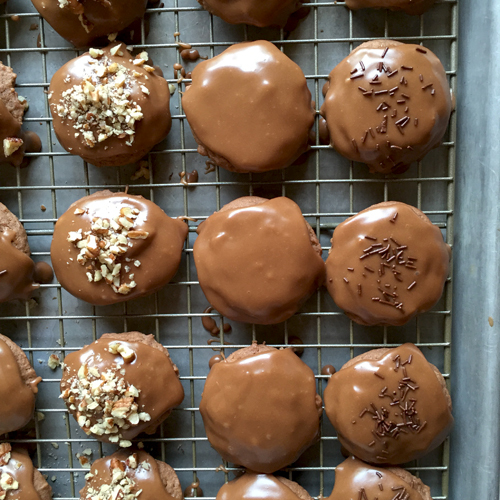 Sprinkle with chopped pecans or chocolate sprinkles, if desired--but do it before the icing sets, or they won't stick. Allow icing to set, about 30 minutes, and then serve.